Regular readers will know that my preferred cleansing method involves the use of cleansing oils, which have a balancing effect on oily and combination skin types, such as mine (I have combination acne-prone skin with an oily t-zone, dehydrated areas & sensitivity). My favourite cleansing oil is DHC Deep Cleansing Oil but I was interested in trying Dermalogica's Precleanse because it's more readily available where I live and I figured that if it worked out well, I could simply stock up in the shops as opposed to having to order my DHC oil online. Like my beloved DHC, Dermalogica Precleanse contains olive oil so I anticipated liking it. Along with skin softening olive oil, Dermalogica Precleanse also contains apricot kernal oil to help soothe irritation & nourish, kukui nut oil to reinforce skin's moisture barrier, borage seed oil to treat inflammation, along with antioxidant rich rice bran oil and vitamin E.
As with all Dermalogica products, the packaging has a minimalist design which gives a clinical appearance. The oil is presented in a plastic bottle with a flip top and whilst I'd have preferred the convenience of a pump dispenser, I found the packaging to be functional nonetheless. The main downside to the packaging is that the plastic is opaque so it's difficult to tell how much product is remaining. I was impressed with the clear directions- simply apply to dry skin, with dry hands and massage into skin before rinsing. As the name suggests, the product is designed to be used as the first step in a double cleanse. However, I use cleansing oils in the morning when I need something quick & easy to use and prefer to avoid foaming face washes (I perform a deep cleanse using a balm in the evening). Whilst it's important to cleanse in the mornings, I felt that a double cleanse would be unnecessary so just used the cleansing oil alone & didn't experience any problems. The oil itself has a lightweight texture, with a pleasant citrus fragrance. As with all oil formulations, the texture lent itself well to facial massage. The hydrophilic (water loving) formula meant that it emulsified into a lightweight milk in contact with water and rinsed away easily, without any greasy residue. Overall, I've been highly impressed with Dermalogica Precleanse. It's an effective cleanser which is quick & easy to use and hasn't irritated my sensitive skin. It's the closest in formulation that I've found to my beloved DHC Deep Cleansing Oil, with the addition of the citrus fragrance adding an extra sense of indulgence (the DHC version is unscented). I'd feel comfortable in recommending this & would have been tempted to repurchase. The only downside (& the reason that I'd be unlikely to repurchase) is the high price, which I was quite shocked to note as being £31.50 for 150ml compared with £21.50 for 200ml of the DHC Deep Cleansing Oil. I simply couldn't justify spending more than £10 more per 100ml on the Dermalogica, when it's so similar to the DHC version. This sounds like something that might work for me. Interesting, thanks for the share. After trying so many medicines and treatments by using different beauty products for my skin this really looks good to me hope it work and I get rid off my problems and I will get a beautiful skin. 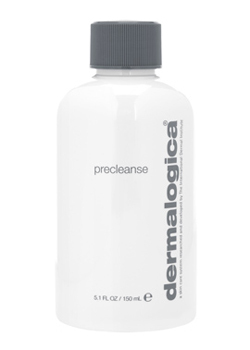 I have also used dermalogica Precleanse. I had ordered it from Total Halsa web shop. I really love dermalogica . my skin became more fresh, it is good cleaner for my sensitive skin. Thanks to dermalogica Precleanse!